With the new Seagull ARF, distributed by Horizon Hobby, you can enjoy quick-build assembly time with this sport-scale ARF. 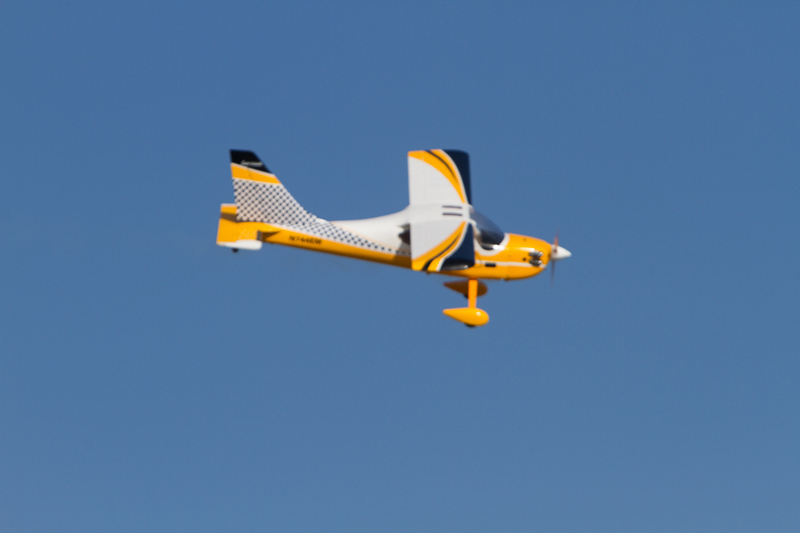 Top-quality balsa and light-ply are used to make the structure, which is covered beautifully with Hangar 9 UltraCote in a winning color combo of yellow, white, and black. Seagull’s Glasair is a well-engineered ARF and has a very quick build time. See what Mike Gantt has to say about this fine aircraft in the video below. Nice sport/scale look. Good color graphics. what is the street price? looks to have LOTS of power with that motor combo. did the kit supply the spinner and wheels? .looks to land well, may do better job of sittin down on short grass field. Good report guys, thanks for the time and effort to share new and different products with us! 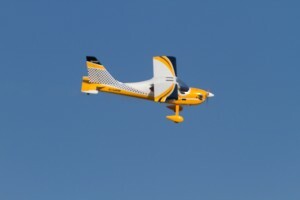 The plane is listed here: http://www.horizonhobby.com/products/glasair-sportsman-2-2-75-91-arf-SEA158 and sells for $300. Everything is included except a power system and guidance package. A very nice and complete ARF. As for power, the Saito has tons! A landing story: During deadlines I had to fly in a decent crosswind. I think I blew away my photographer and myself when I landed it coming toward me first hitting one wheel then the other while swinging the tail (releasing rudder) and touching down as smooth as silk. I was stoked! Hey John, nice video. I really appreciate your efforts, and love this aircraft as well. So I ordered one! I have it now, but its still in the box as I’m still in the process of acquiring parts and pieces for it. I selected a Zenoah G 200PU 20cc gasser for power, Hitec Eclipse 7 PRO for electronics, as well as Hitec digital servos all around. In your video I didn’t quite catch what you did for batteries, and how you set that part of the build up. Did you use just one battery? If so, what size? I was considering a redundant system myself, as I like to play it safe with my gear, however, I’m always interested in learning something different. I have two Hitec Eclipse 7 PRO’s, one in 72mhz, the other in 2.4mhz. 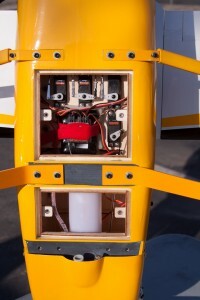 My question is: How do you feel about running 2.4mhz on large scale aircraft? In my minds (small) eyes, I get nervous about using 2.4 because of the range limits I’ve read about. Perhaps this may be a good subject for an article, or most likely there’s some article’s on this already. Also, did you use any type of rubber engine mounts on this build? I live out in the ‘sticks’ so info is usually through script or on-line. Thanks again, and…Great Job! I wish I had yours! P.S. For anyone looking for a float-set for this model…don’t bother until about May 8. I’ve checked everyone! Happy Landings!!! I’d love to meet up sometime and do a little, “Formation” flying. I’m the owner of N744EM…the actual Glasair Sportsman. Great job! 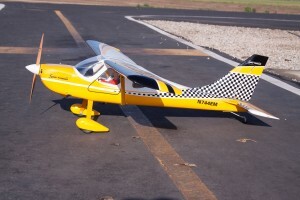 What Gas engine can I use to fly this airplane? Would a DLE 20cc provide enough power? Can Saito 82 fly the airplane if I fly glow? It’s an exact of copy to the color and registration of Capt Everett Mellish’s GlasAir in Portland. His is on floats now. Great looking and flying airplane. Great review. What is a good sized gas engine to use in flying the airplane? 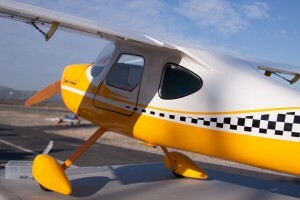 Would a DLE 20cc or 30cc be a good engine for flying with gas. Thanks for any information. Also what are good servos to use since I might fly gas?